In the midst of winter, before snow melts and the swallow returns, plum trees blossom onto the barren landscape, bracing the harshness of winter and reminding people spring will come. Celebrated here is the vitality of life, endurance through hardship, and hope that life will regenerate. The plum blossom has been an important symbol in Chinese culture. As a “friend of winter,” the plum blossom most vividly represents the value of endurance, as life ultimately overcomes through the vicissitude of time. The fragrance of plum blossoms “comes from the bitterness and coldness,” as the Chinese saying goes. Souls are tempered in the depth of experience, growing in inner strength and unyielding courage. Unity of culture and nature has been an important part of the Chinese tradition, and elements of nature embody important cultural values. The plum, together with the orchid, bamboo, and chrysanthemum, have been named the “four nobles” of plants by the ancient Chinese, each because of its noble characteristics, such as purity (orchid), uprightness (bamboo), and humility (chrysanthemum). Zhu Xi, a noted Song Dynasty Confucian scholar, gave the plum four virtues: the great potential in the bud, prosperity in the flower, harmony in the fruit, and rightness in its maturity—all of which embody the characteristics of heaven (qian), according to the Book of Change. Chinese also see the five-petaled flower as symbolizing five blessings: longevity, prosperity, health, virtue, and good living. Plum, or Prunus mume, is an arbor that originated in southwest China. For over 3,000 years, plum trees have been planted in China, including North China, where the winter is colder. From China, the plum spread to Korea, Japan (where the plum is called “ume”), and later to other countries as an ornamental plant. The plum tree flowers before its leaves come out in the spring. Plum blossoms typically have five petals, single- or multi-layered, with the colors pink/red, white, and yellow as common. The pink/red variety is used often for the Chinese New Year in late January and early February. China has a long history of using and enjoying the plum tree and its flower. Plum fruit has been used for food for more than 3,000 years, and plum blossoms have been appreciated in gardens and around homes for over 2,000 years. In the 5th century, princesses and court women started to use plum blossoms for decoration, and this helped make the flower popular. The plum blossom has been an important object for poems and paintings since the Tang Dynasty, reaching a peak during the Song Dynasty. 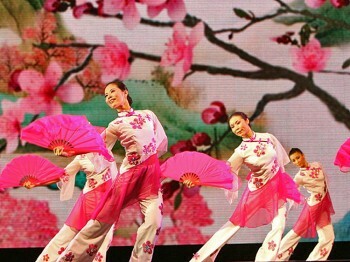 Under the brush pen of literati and artisans, the plum blossom’s spirit was celebrated. occupying the focal scenery of the small garden. secret fragrance floats lightly in the moonlit dusk. Intoxicated with the sweet smell of plum blossom. from Qingyang palace to Huanhua brook. each enjoying the blossom by a plum tree. Su Dongpo, also a celebrated Song Dynasty poet, is probably responsible for the style of art that focuses on portraying the inner spirit of nature, rather than its outer forms. He said, “The beauty of the plum goes beyond the sour taste of its fruit.” His idea of transcending the physical deeply influenced the painting of plum blossoms, especially in the style of “ink plum,” using only the black ink to paint the plum tree and blossoms. not mixing with the dust of peach and pear flowers. spreading to heaven and earth, bringing spring to all the land. Since the Tang Dynasty, each generation of poets and painters has enjoyed its noted artists of the plum blossom. 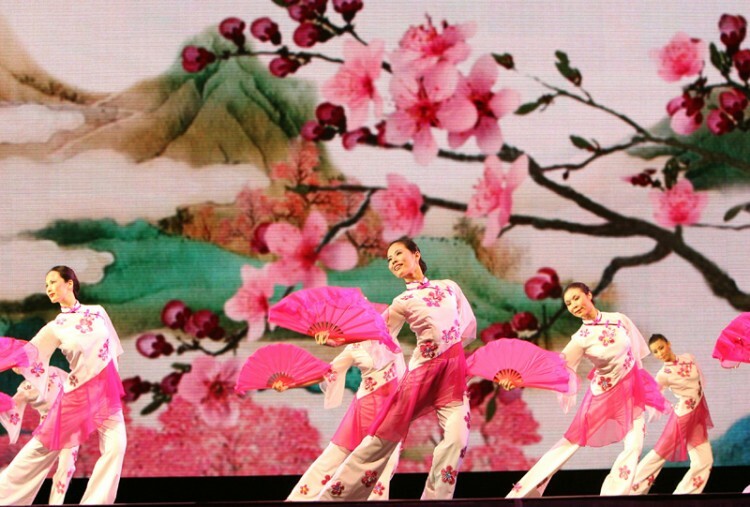 Today, Shen Yun Performing Arts brings the plum blossom to the stage of classical Chinese dance, celebrating its purity, beauty, and forbearance. Indeed, the entire Shen Yun performance can be captured by the plum blossom since, despite the suffering, hardships, and loss of Chinese culture, hope is eternal, and renewal is not far away.